I was lucky enough to have a spider new for the British checklist wander past my hand lens whilst I was examining moss on trees near Bovey Tracey in Devon just before Christmas 2016. 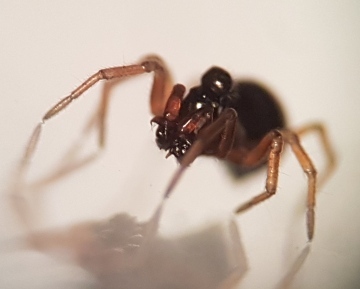 Not being in spider mode it almost got away but I managed to pot it, and seeing it was a tiny adult male linyphiid with inflated head region and interesting palp structures I took it home to look at under a dissecting microscope. I then failed, despite much effort, to match its palps to any illustration in my British literature. Under the microscope I could see a brown scutum covering the entire dorsal surface of the abdomen. This, coupled with the inflated head area, trichobothria etc., convinced me that it was a Pelecopsis species, but the palps had an apophysis on the dorsal surface of the tarsus unlike anything in the British fauna, and the tibial apophysis had a long lower projection which also clearly differentiated it from our native Pelecopsis species. On widening the search to European species, Pelecopsis susannae (Simon 1915), was clearly a very close match, fortunately Robert Bosmans et al had redescribed this species so there was a high quality illustration for comparison. The spider was found amidst good bryophyte cover consisting primarily of Metzgaria furcata and Frullania dilatata on a mature poplar in open, fairly un-polluted, but otherwise unremarkable parkland near Bovey Tracey. A stream runs through the park passing near the trees where the specimens were found. Gardens back onto the park, and more extensive park and woodland is nearby. After publishing my find via social media, it was suggested that I post on the BAS Members forum where I quickly received offers of help. Robert Bosmans supplied me with his paper and confirmed that my photographs looked to be of this species. Grant Brown offered DNA sampling and Pierre Oger offered to photograph it. The main advice however was to send it to Peter Merrett for his verdict. I sent my specimen to Peter who agreed that this was, indeed, Pelecopsis susannae, as also did Robert Bosmans from the photographs I posted on the forum. I returned to the site and with the help of my wife, used a broad soft paint brush to gently sweep bryophytes on the poplars into a deep tray pushed up against the trunk. Within minutes I had secured two more males, an Erigone dentipalpis and what I assume is a female P.susannae, along with a lot of collembola and psocoptera. One male in captivity was seen to make a small sheet web (less than a centimetre across). This may be an isolated introduction, but it is worth checking moss covered trees as prey is obviously abundant in this habitat even in winter and the males of this species really do have highly characteristic genitalia.